Always dubbed as the ultimate bachelorette, 39-year-old Niki Chow (周勵淇) surprised fans today by announcing that she is already married. Her husband is former Undercover <卧底> co-star, 45- year-old Mainland Chinese actor Fu Yiming (傅浤鳴). In November, the couple got married overseas in an intimate wedding ceremony with their families present. A military actor, Yiming later appeared in films, television dramas, and stage plays. 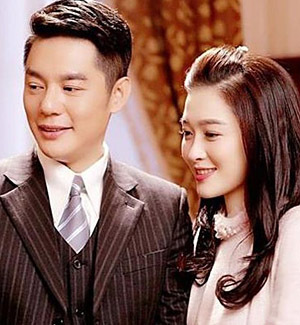 The award-winning actor was already married to actress Cheng Hao (程愫) and they have a son together when he met Niki on the set of 2014 Mainland Chinese drama, Undercover. But it was reported that Yiming and Niki would often meet up after filming hours and talk on the phone to discuss the script together. In March 2017, Yiming ended his 20-year-marriage with Cheng Hao. Three months later, he was photographed in Hong Kong having dinner with Niki. Due to the close timing from his divorce to getting involved with Niki, it was even speculated that Niki may be a possible third party in his first marriage. But Niki’s older sister Kathy Chow (周汶錡) denied this was the case, and also negated the media’s speculation that Niki’s sudden marriage is due to pregnancy. The couple will not hold another banquet in Hong Kong, since they already held a small wedding overseas and would prefer to keep the celebration low profile. Ohhhhhh homewrecker. Modern day, doesn’t matter. As i always say, if they dumped another for you, they can do the same thing to you. i hope that’s not the case here because i like Niki and I can’t see her as a 3rd party. maybe after he divorced his wife, he decided to pursue Niki. it wouldn’t be Niki’s fault in that case. Why did Niki leave Jeremy Tsui? He was so much good looking and younger. And what’s going on…celebs getting secretly married and then letting people know during this time, like Edwin Siu and Priscilla. Must be a trend…let’s see who’s next. @peachyogurt I know right, from that good looking dude to this? He’s only 45 but looks way older. But perhaps the young good looking and RICH dude dumped her who knows….I like Edwin Siu & Priscilla Wong…They are a cute couple and PW is rich isn’t she but she seems very easygoing and low key. Something feels odd about this one… I have a feeling more news to come in the near future. It feels rushed and Niki has never been a ‘mandarin’ person. Maybe he is rich? Maybe she is pregnant? Maybe Mak Ling Ling (麥玲玲) told her that she needs to marry by the end of this year? Wow this is shocking news we always thought she’s a bachelorette I don’t think it’s the pregnancy problem some people just wanted to get married but we’ll see about later. Imagine Charmaine came out saying she’s already married too? The snake woman? hahha lol..I doubt it. Since she claims to have dated over 10 plus bf’s perhaps she’s just dating and not marrying material? Maybe not pregnant but not a third party? Ha. Not officially dating a married man but allowing oneself to be involved with someone’s husband does not make much difference to one who openly dates a married man. since the day Kevin broke Niki heart so hard, that was a harsh news to accept back then it was consider a golden couple of that time, I wish all the happiness for her now. I don’t blame her for being desperate but why mess with a married man who has a kid and wife. Besides, she downgraded herself, she could get someone much better or at least someone decent looking. From kevin and her previous bf to this guy, wow! 180 degree turn simply shocking. Dude reminds me of William Hung the reject. I guess she is desperate in finding a man she just closed her eyes and picks whoever or whatever. I just hope karma will not catch up to her later in life. She ruined someone’s marriage, sometime those things will come back and haunt her one day.